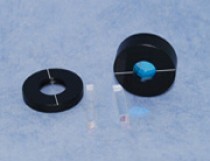 LiNbO3 ( Lithium Niobate ) is one of the most thoroughly characterized nonlinear optical materials and suitable for a variety of frequency conversion applications. Crystal growing techniques allows consistent production of large crystals of high perfection. MgO doped LN ( typical doping: 5% ) is developed to reduce the photorefractive effect of the intrinsic material and therefore can be used for higher energy applications.